Not to be confused with the Kri language. Cree /ˈkriː/ (also known as Cree–Montagnais–Naskapi) is a dialect continuum of Algonquian languages spoken by approximately 117,000 people across Canada, from the Northwest Territories to Alberta to Labrador. If classified as one language, it is the aboriginal language with the highest number of speakers in Canada. The only region where Cree has any official status is in the Northwest Territories, alongside eight other aboriginal languages. There, Cree is spoken mainly in Fort Smith and Hay River. Endonyms are Nēhiyawēwin ᓀᐦᐃᔭᐍᐏᐣ (Plains Cree), Nīhithawīwin ᓃᐦᐃᖬᐑᐏᐣ (Woods Cree), Nehirâmowin (Atikamekw), Nehlueun (Western Montagnais, Piyekwâkamî dialect), Ilnu-Aimûn (Western Montagnais, Betsiamites dialect), Innu-Aimûn (Eastern Montagnais), Iyiniu-Ayamiwin ᐄᓅ ᐊᔨᒨᓐ (Southern East Cree), Iyiyiu-Ayamiwin ᐄᔨᔫ ᐊᔨᒨᓐ (Northern East Cree), Ililîmowin ᐃᓕᓖᒧᐎᓐ (Moose Cree), Ininîmowin ᐃᓂᓃᒧᐎᓐ (Eastern Swampy Cree), and Nēhinawēwin ᓀᐦᐃᓇᐌᐎᐣ (Western Swampy Cree). Cree is believed to have begun as a dialect of the Proto-Algonquian language spoken 2,500 to 3,000 years ago in the original Algonquian homeland, an undetermined area thought to be near the Great Lakes. The speakers of the proto-Cree language are thought to have moved north, and diverged rather quickly into two different groups on each side of James Bay, after which time, the eastern group began to diverge into separate dialects, whereas the western grouping probably broke into distinct dialects much later. After this point it is very difficult to make definite statements about how different groups emerged and moved around, because there are no written works in the languages to compare, and descriptions by Europeans are not systematic; as well, Algonquian people have a tradition of bilingualism and even of outright adopting a new language from neighbours. A traditional view among 20th century anthropologists and historians of the fur trade posits that the Western Woods Cree and the Plains Cree (and therefore their dialects) did not diverge from other Cree peoples before 1670, when the Cree expanded out of their homeland near James Bay because of access to European firearms. By contrast, James Smith of the Museum of the American Indian stated, in 1987, that the weight of archeological and linguistic evidence puts the Cree as far west as the Peace River Region of Alberta before European contact. Cuthand argues three reasons for the loss of the Cree language. First, residential schools cultivated the prejudice that their language was inferior. While students were still speaking their native language at home, their learning stopped at school. When they left residential schools as adults, they went home and their vocabulary and knowledge of language did not include concepts or forms that an adult speaker who had not been taken to a residential school would have. Cuthand also argues that the loss of the Cree language can be attributed to the migration of native families away from the reserve, voluntarily or not. Oftentimes, the elders are left on the reserve. This breaks up the traditional intergenerational flow of lingual knowledge from elder to youth. The third point Cuthand argues is that Cree language loss was adopted by the speakers. Parents stopped teaching their children their native language in the belief that doing so would help their children find economic success or avoid discrimination. The Cree dialect continuum can be divided by many criteria. Dialects spoken in northern Ontario and the southern James Bay, Lanaudière, and Mauricie regions of Quebec differentiate /ʃ/ (sh as in she) and /s/, while those to the west have merged the two phonemes as /s/ and in east the phonemes are merged as either /ʃ/ or /h/. In several dialects, including northern Plains Cree and Woods Cree, the long vowels /eː/ and /iː/ have merged into a single vowel, /iː/. 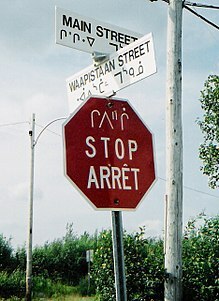 In the Quebec communities of Chisasibi, Whapmagoostui, and Kawawachikamach, the long vowel /eː/ has merged with /aː/. Another important phonological variation among the Cree dialects involves the palatalisation of Proto-Algonquian *k: East of the Ontario–Quebec border (except for Atikamekw), Proto-Algonquian *k has changed into /tʃ/ or /ts/ before front vowels. See the table above for examples in the *kīla column. Very often the Cree dialect continuum is divided into two languages: Cree and Montagnais. Cree includes all dialects which have not undergone the *k > /tʃ/ sound change (BC–QC) while Montagnais encompasses the territory where this sound change has occurred (QC–NL). These labels are very useful from a linguistic perspective but are confusing as East Cree then qualifies as Montagnais. For practical purposes, Cree usually covers the dialects which use syllabics as their orthography (including Atikamekw but excluding Kawawachikamach Naskapi), the term Montagnais then applies to those dialects using the Latin script (excluding Atikamekw and including Kawawachikamach Naskapi). The term Naskapi typically refers to Kawawachikamach (y-dialect) and Natuashish (n-dialect). wood1236 th k s ī In this dialect ē has merged into ī.
plai1258 Western York Cree (r)\th k s ī Missinipi Cree (Nīhirawīwin). Also known as "Rocky Cree". Historical r have transitioned to th and have merged into Woods Cree. While Woods Cree proper have hk, Missinipi Cree have sk, e.g., Woods Cree mihkosiw v. Missinipi Cree miskosiw : "he/she is red". Plains Cree Plains Cree Northern Alberta Cree y k s ī (northern) Divided to Southern Plains Cree (Nēhiyawēwin) and Northern Plains Cree (Nīhiyawīwin or Nīhiyawīmowin). In the Northern dialect, ē has merged into ī.
swam1239 Western Swampy Cree n k s ē Eastern Swampy Cree, together with Moose Cree, also known as "West Main Cree," "Central Cree," or "West Shore Cree." In the western dialect, š has merged with s. Western Swampy Cree also known as "York Cree;" together with Northern Plains Cree and Woods Cree, also known as "Western Woodland Cree." moos1236 n\l k š ē (upland) Together with the Eastern Swampy Cree, also known as "West Main Cree," "Central Cree," or "West Shore Cree." In Swampy Cree influenced areas, some speakers use n instead of l, e.g., upland Moose Cree iliniw v. lowland Moose Cree ililiw : "human". nort1552 y k\č š ā Also known as "James Bay Cree" or "East Main Cree". The long vowels ē and ā have merged in the northern dialect but are distinct in the southern. Southern East Cree is divided between coastal (southwestern) and inland (southeastern) varieties. Also, the inland southern dialect has lost the distinction between s and š. Here, the inland southern dialect falls in line with the rest of the Naskapi groups where both phonemes have become š. Nonetheless, the people from the two areas easily communicate. In the northern dialect, ki is found in situations were short unaccented vowel a transitioned to i without changing the k to č.
nask1242 Western Naskapi y č š~s ā Western Naskapi (or simply referred to as Naskapi). Spoken in Kawawachikamach, Quebec. Davis Inlet Eastern Naskapi n č š~s ē Eastern Naskapi; also known as Mushuau Innu. Spoken in Natuashish, Labrador. mont1268 Western Montagnais l č š ē Western Montagnais (Lehlueun); also known as the "Betsiamites dialect"
Uashaui Innuts n č š~h ē Part of Western Montagnais, but more precisely referred to as Central Montagnais. š is realized as h in intervocalic position, especially amongst middle-aged and young speakers. Mingan Eastern Montagnais n č š~h ē Eastern Montagnais (Innu-aimûn). š is mostly realized as h.
This table is made to show all possible consonant phonemes that may be included in a Cree language. In dictionaries focused on Eastern Swampy Cree, Western Swampy Cree may readily substitute ⟨sh⟩ with ⟨s⟩, while Lowland Moose Cree may readily substitute ⟨ñ⟩ with their ⟨l⟩. In dictionaries focused on Southern Plains Cree, Northern Plains Cree may readily substitute ⟨ē⟩ with ⟨ī⟩, while materials accommodating Rocky Cree will indicate the Plains Cree [j] that is [ð] in Rocky Cree as ⟨ý⟩. Similarly, in dictionaries focused on Western Swampy Cree, Woods Cree may readily substitute ⟨ē⟩ with ⟨ī⟩, while materials accommodating Woods Cree will indicate the Western Swampy Cree [n] that is [ð] in Woods Cree as ⟨ń⟩. Atikamekw uses ⟨c⟩ [ʃ], ⟨tc⟩ [t͡ʃ], and ⟨i⟩ [j] (which also serves as ⟨i⟩ [i]). Cree features a complex polysynthetic morphosyntax. A common grammatical feature in Cree dialects, in terms of sentence structure, is non-regulated word order. Word order is not governed by a specific set of rules or structure; instead, "subjects and objects are expressed by means of inflection on the verb". Subject, Verb, and Object (SVO) in a sentence can vary in order, for example, SVO, VOS, OVS, and SOV. The suffix -a marks Susan as the obviative, or 'fourth' person, the person furthest away from the discourse. kakwēcimēw kisēýiniwa → He asked the old man. kisēýiniwa kakwēcimēw → It was the old man he asked. Cree dialects, except for those spoken in eastern Quebec and Labrador, are traditionally written using Cree syllabics, a variant of Canadian Aboriginal syllabics, but can be written with the Latin script as well. Both writing systems represent the language phonetically. Cree is always written from left to right horizontally. The easternmost dialects are written using the Latin script exclusively. The dialects of Plains Cree, Woods Cree, and western Swampy Cree use Western Cree syllabics and the dialects of eastern Swampy Cree, East Cree, Moose Cree, and Naskapi use Eastern Cree syllabics. In this syllabic system, each symbol, which represents a consonant, can be written four ways, each direction representing its corresponding vowel. Some dialects of Cree have up to seven vowels, so additional diacritics are placed after the syllabic to represent the corresponding vowels. Finals represent stand-alone consonants. The Cree language also has two semivowels. The semivowels may follow other consonants or be on their own in a word. Speakers of various Cree dialects have begun creating dictionaries to serve their communities. Some projects, such as the Cree Language Resource Project (CLRP), are developing an online bilingual Cree dictionary for the Cree language. Cree has not commonly or traditionally used the period (.) at the end of sentences when syllabics are used. Instead, either a full-stop glyph (᙮) or a double em-width space have been used between words to signal the transition from one sentence to the next. In alphabetic writing, the use of punctuation has been inconsistent. For instance, in the Plains Cree dialect, the interrogative enclitic cî can be included in the sentence to mark a yes-no question such that this is sometimes considered to be sufficient without including a question mark (?). However, in many modern publications and text collections (cf.) full punctuation is used. Additionally, other interrogatives (where, when, what, why, who) can be used, as in other languages, and questions marks can thus be used for such questions in Cree as well. Cree is also a component language in two contact languages, Michif and Bungi. Both languages were spoken by members of the Métis, the Voyageurs, and European settlers of Western Canada and parts of the Northern United States. Michif is a mixed language which combines Cree with French. For the most part, Michif uses Cree verbs, question words, and demonstratives while using French nouns. Michif is unique to the Canadian prairie provinces as well as to North Dakota and Montana in the United States. Michif is still spoken in central Canada and in North Dakota. Bungi is a creole based on Scottish English, Scots, Scottish Gaelic, Cree, and Ojibwe. Some French words have also been incorporated into its lexicon. This language flourished at and around the Red River Settlement (modern day location of Winnipeg, Manitoba) by the mid to late 1800s. Bungi is now virtually extinct, as its features are being abandoned in favor of standard English. Cree has also been incorporated into two other mixed languages within Canada. The Oji-Cree language (also Severn Ojibwe), spoken in parts of Manitoba and western Ontario, is a mixed language of Cree and Ojibwe, and the Nehipwat language, which is a blending of Cree with Assiniboine. Nehipwat is found only in a few southern Saskatchewan reserves and is now nearing extinction. Nothing is known of its structure. The social and legal status of Cree varies across Canada. Cree is one of the eleven official languages of the Northwest Territories, but is only spoken by a small number of people there in the area around the town of Fort Smith. It is also one of two principal languages of the regional government of Eeyou Istchee/Baie-James Territory in Northern Quebec, the other being French. Cree has about 117,000 documented speakers today. They are still a minority language given the dominance of English and French in Canada. There are programs in place to maintain and revitalize the language, though. In the Quebec James Bay Cree community, a resolution was put into action in 1988 that made Cree the language of education in primary schools and eventually elementary schools. The Mistissini council decided to require their employees to learn Cree syllabics in 1991. The Cree School Board now has their annual report available in both English and Cree. There is a push to increase the availability of Cree stations on the radio. In 2013, free Cree language electronic books for beginners became available for Alberta language teachers. The Government of the Northwest Territories releases an annual report on First Nations languages. The 2016–2017 report features successes they have had in revitalizing and supporting and projects they are working on. For example, they released a Medicinal Plant Guide that had information in both Cree and English. An important part of making the guide was input from the elders. Another accomplishment was the dubbing of a movie in Cree. They are working on broadcasting a radio station that "will give listeners music and a voice for our languages". ^ Canada, Government of Canada, Statistics. "Language Highlight Tables, 2016 Census - Aboriginal mother tongue, Aboriginal language spoken most often at home and Other Aboriginal language(s) spoken regularly at home for the population excluding institutional residents of Canada, provinces and territories, 2016 Census – 100% Data". www12.statcan.gc.ca. Retrieved 2017-11-22. ^ a b "Education, Culture, and Employment". Government of the Northwest Territories. Retrieved October 4, 2017. ^ Smith, James G. E. (August 1987). "The Western Woods Cree: Anthropological Myth and Historical Reality". American Ethnologist. 14 (3): 434–48. doi:10.1525/ae.1987.14.3.02a00020. JSTOR 644951. The weight of evidence now indicates that the Cree were as far west as the Peace River long before the advent of the European fur traders, and that post-contact social organization was not drastically affected by the onset of the fur trade. ^ a b c Cuthand, D. (2007). Askiwina: A Cree world. Regina: Coteau Books. ^ Linguasphere code 62-ADA is called "Cree+Ojibwa net", listing four divisions of which three are shown here—the fourth division 62-ADA-d representing the Ojibwe dialects, listed as "Ojibwa+ Anissinapek". ^ Hammarström, Harald; Forkel, Robert; Haspelmath, Martin; Bank, Sebastian, eds. (2016). "Cree–Montagnais–Naskapi". Glottolog 2.7. Jena: Max Planck Institute for the Science of Human History. ^ a b Wolfart, H. C., & Carroll, J. F. (1981). Meet Cree: A guide to the Cree language (New and completely rev. ed.). Edmonton: University of Alberta Press. ^ Christoph., Wolfart, H. (1981). Meet Cree : a guide to the Cree language. Carroll, Janet F. (New and completely rev. ed.). Edmonton: University of Alberta Press. ISBN 0888640730. OCLC 8925218. ^ "Agreement on Governance in the Eeyou Istchee James Bay Territory Between the Crees of Eeyou Istchee and the Gouvernement du Québec, 2012" (PDF). Archived from the original (PDF) on 2017-10-11. Retrieved 2012-09-07. ^ Betowski, Bev. "E-books show kids the colour of Cree language". University of Alberta News & Events. Archived from the original on 2013-01-30. Retrieved 2013-01-31. Bakker, Peter and Robert A. Papen. "Michif: A Mixed Language based on French and Cree". Contact Languages: A Wider Perspective. Ed. Sarah G. Thomason. 17 vols. Philadelphia: John Benjamins Publishing Co. 1997. ISBN 1-55619-172-3. Carter, Sarah. Aboriginal People and Colonizers of Western Canada to 1900. University of Toronto Press Inc. Toronto: 1999. ISBN 0-8020-7995-4. Junker, Marie-Odile, Marguerite MacKenzie, Luci Salt, Alice Duff, Daisy Moar & Ruth Salt (réds) (2007–2008) Le Dictionnaire du cri de l'Est de la Baie James sur la toile: français-cri et cri-français (dialectes du Sud et du Nord). MacKenzie, Marguerite, Marie-Odile Junker, Luci Salt, Elsie Duff, Daisy Moar, Ruth Salt, Ella Neeposh & Bill Jancewicz (eds) (2004–2008) The Eastern James Bay Cree Dictionary on the Web : English-Cree and Cree-English (Northern and Southern dialect). Languagegeek: Cree—OpenType font repository of aboriginal languages (including Cree). Path of the Elders – Explore Treaty 9, Aboriginal Cree & First Nations history. This page was last edited on 21 March 2019, at 00:29 (UTC).